Ground Floor, Building 1, 658 Church Street, Richmond, Victoria 3121 AND Hardie Grant Books (UK) 5th and 6th Floor, 52-54 Southwark Street, LONDON SE1 1UN. Okay, I was a bit taken aback by this book. Jarrod Kimber may have been born in Melbourne – Down Under, as everyone loves to say – but I didn’t expect to find his profile at the back of the book nor the first chapter in this essentially chronological series of essays to start and indeed end with a – very sad – event in 2014. Jarrod has a distinctive way of writing with some short sentences and some very short sentences. Usually with a verb, though. You get the idea? I’m jealous too. Especially as it reads so well and easily. And even more so as it is so factually fascinating. Subjects naturally vary from the earliest days of Test cricket – well, as Jarrod points out, the first Test cricketers weren’t actually aware of their status at the time of the match – until the current day. He writes in such a way that the reader almost feels as if they know the players from yesteryear. 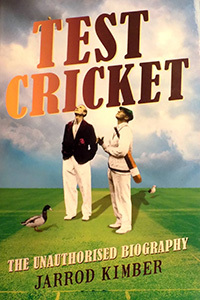 Despite its wittiness, Test Cricket The Unauthorised Biography starts with the tragic death, in 2014, of Philip Hughes before charting in amusing fashion some of the legendary names of the game including Grace and Fred Spofforth. And ends with the latest Indian cricketing great, Virat Kohli, with many, many famous names along the way. Jarrod has a way of almost replaying some of the finest moments from the games and observations. Some might be short, some might take a page but, when I read some of the moments late at night and ready for sleep, they quite easily dispelled the need. Okay, I have – and I am sure others – will have heard of the events mentioned but there is usually something extra, a perception and it is the most fascinating book encompassing many of Test cricket’s greatest moments. ODI moments also including India’s 1983 World Cup win against, at the beginning of the tournament and probably in the final, against the run of play. I am sure that Jarrod Kimber has researched a lot within this book and, because of its easy and flowing nature, it is a terrific book. There’s a lot in it which will be new, I am sure, to many readers and my advice to any prospective reader would be to go out and buy it.